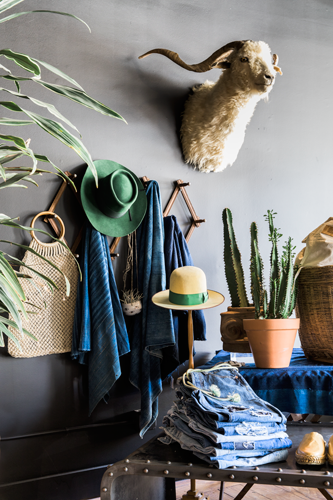 Interior designers Tim and Linda Arbogast describe Martin Mattox, their new Auburn boutique, as a “modern mercantile.” Like a general store in the Gold Rush frontier, Martin Mattox carries clothing, furniture, housewares, provisions and more. The couple opened the chic shop this past summer in a historic three-level storefront that once housed an 1890s pharmacy. You’ll find a dizzying array of new and vintage: 1930s French leather club chairs and a brand-new pleated leather sofa; vintage 501s patched with kimono fabric; postcards and stationery; straw hats (new and old); a taxidermied ram; an old snake charmer’s basket; baroque jewelry from Sacramento maker Pam Tuohy and art by her husband, Ed Novinsky; coffee from Clementine Roasters and chai concentrate from North Fork Chai (local companies). In the apothecary: fragrant soaps, candles, body products, Luvandus perfume from local maker Tyler Monk, Japanese charcoal toothbrushes and robes from LA linen company Matteo. A light-filled atelier includes women’s clothing, pillows, oversized garden pots, jute bags and baskets, and a canopied bamboo daybed. “It’s a little bit of everything,” says Tim.